Junmar Fajardo is a Filipino professional basketball player. He was born on November 17, 1989. His first name is sometimes spelled as June Mar or Junemar. Fajardo's height is 6 ft 11 in or 2.11 m.
Junmar was born on November 17, 1989 in Compostela, Cebu, Philippines. Fajardo studied his high school education in Bato National High School in Toledo, Cebu. 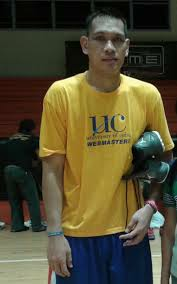 In College he went to the University of Cebu, where he was one of the basketball varsity players. During Junmar Fajardo's college days in the University of Cebu he was one of the basketball varsity players of the school. Junmar was playing center because of his outstanding height. After graduating in college, Junmar was then drafted by the PBA. He was the first overall pick in the round 1 of the 2012 PBA draft. Junmar was selected by Petron Blaze Boosters, a PBA team.